Discussion in 'Religion & Philosophy' started by XXJefferson#51, Jan 27, 2019. Second, Jesus performed many miracles in His day — many of them in front of His skeptics — and they still didn’t believe His claims. It’s quite possible that a modern skeptic would obstinately reject miraculous evidence today, as well. https://stream.org/must-god-prove-exists/ This article discusses what it would take for an atheist to believe that God exists. It is of the opinion that no matter the miracle or event, the atheist would look for any other possible explanation for what happened except for God. It mentions that Jesus performed many miracles when He was here and still the skeptics of His day did not believe in Him. Some of the rulers demanding that Jesus be crucified actually witnessed His raising Lazarus from the dead not many days before. If God demonstrated He existed then the concept of Christian faith would be redundant. Mind you it would do wonders for conversions. Guessing at what the gods "must" do presumes we know what the gods intend as an outcome as well as understanding what methods are available to gods. I don't believe we have any idea as to why a god would want a place to store forever those who correctly identifed that particular god as real and then successfully meet some additional set of inprecisely identified criteria. And, it's even more startling that such a god would care to keep thee rest "alive" in order to torture them throughout eternity. What possible objective does THAT heelp to accomplish? I would argue that we have no reason to believe that a god's objectives would be better met by that god proving his own existence. RiaRaeb and Jonsa like this. People over estimate their influence on many things. The church of god says there is no hell, but only death of the soul. The roman church says we choose hell. Hell is an outgrowth of sin, not of god. Don't personally know. I get what cog is saying. They proved it to me. Not sure about rc. I've read stories of saints seeing hell and what that is like. I don't think I'd want to visit. We underestimate our influence on many things, too. It's easy to overlook the multiplier of population. On the other hand, Adam and Eve saw God face to face in person in their perfect condition and still fell. God knows that even if he did the signs and wonders to prove his existence the deliberate unbeliever would rationalize disbelief anyway. No one is going to burn forever in hell. The consequences of hell are forever as in eternal separation from the presence of God. It destroys the soul and consumes its victims. Then the earth is recreated like new Eden upon the ashes of what was the present earth and those not saved. Everyone up to the present who has lived by the best light the Spirit showed them in their life will be saved. Given that we can't even agree on what Trump said and it's meaning, even though it's been recorded on tape and can be re-watched and dissected at any time, I find it cute that people are accepting of what some people wrote down years after the event 2,000 years ago. And given that a middle-aged English women got her book published in every language and shipped to every land in the world in under two months, I just can't buy that an omnipotent being was that enthralled with the contents of the Bible considering He would allow it to take 1,500 years to reach the same audience. Maybe God enjoyed Harry Potter more than the Bible. You nor I have any clue whether or not Jesus performed any miracles. Folks who never knew Jesus - nor heard him speak - writing decades after the death of Jesus claimed miracles were performed. Do you believe in the miracles that Zeus performed as well on the basis of folks writing stories about Zeus ? Do you believe in the miraculous deeds of other Messianic hero's such as Theseus on the basis of writings that have come down to us ? - or perhaps believe in the miraculous deeds of other Messianic figures from the time of Jesus. It was a common theme. If Jesus in fact did perform such wonders - How come Paul did not know anything about these supposed miracles ? You switched from hell back to earth. And, it sounds like you might be suggesting that the "soul" of a nonbeliever isn't everlasting. I'm not sure how to resolve the differences between your post and standard Christian orthodoxy. How "dead" was Lazarus? Did they detect no brain activity? Did they have him on a heart monitor? What was his body temperature? We know today that David Copperfield made the Statue of Liberty disappear. Then, he put it back. The idea that people are going to be alive being tortured by burning for the ceaseless ages of eternity for the mistakes/sins of a human life time is not a universal Christian belief. Their eternal separation from God is universal. Well, it's interesting to work out what might be "universal Christian belief". There are fairly serious issues that are outside of agreement. That's not universal held by Christians either, actually. First, even though this approach presumes the atheist would be open to believing in God if there were sufficient evidence, I’ve never been convinced that such a person would actually believe in God even if their condition was surprisingly met. Well I'm not the kind of atheist you appear to be thinking of, in fact I suspect many non-believers aren't the kind of atheist you're thinking of. To me, any given defined God or other religious belief is no different to any other belief or claim and I treat them the same. My opinion on gods is the same as my opinion on alien visitors, for many of the same reasons. As someone else already said, if there was sufficient evidence for the existence of them, the result wouldn't be belief (in this context), it would be knowledge. Since you're clearly a believer in a specific faith, the question can be addressed to you. Would you actually believe in some other religious claims if there were sufficient evidence of them, even if they directly contradicted your current beliefs? Given that is about something neither of us currently believe, why would your answer to that be any different to mine? This article discusses what it would take for an atheist to believe that God exists. That "article" presents a weak straw-man argument to knock down (with unnecessary complexity - God simply doesn't levitate cars so the whole concept is meaningless). It is of the opinion that no matter the miracle or event, the atheist would look for any other possible explanation for what happened except for God. I'm sure many would, but equally, many believers would look for any possible explanation that involved their specific god. You're not really working towards an atheist problem but a human problem. And you're human too. RiaRaeb, BillRM and yardmeat like this. I always find this argument strange since YOU don't believe in 99% of people's interpretations of God. Would YOU believe in the Muslim god if suddenly he appeared and gave absolute proof of His existence? When a Hindu is cured of cancer, do you believe it's a "miracle"? I know a atheist who survived an aneurysm that amazed doctors ... does that prove that belief in "no God" saved him? BillRM and WillReadmore like this. I'm an atheist, but I frequently make use of religious imagery. Around my home office, for example, I have statues of various gods of wisdom: Odin, Ganesha, Thoth, Hermes. I've been struggling quite a bit with identity lately and have been focusing strongly on the things I value and want to practice more of in my life, namely said wisdom, but also courage. Since Athena is the Greek goddess of both wisdom and courage, I decided I should probably work in some imagery of her as well, but never found quite what I was looking for. Now, back in November I had a particularly hard day at work and was having a particularly hard time with my identity issues, struggling with impostor syndrome and wondering if I had made the right life choices, whether I could really ever find the meaning I sought in my line work. I took a day off of work to do some soul searching, and on that day I read what Homer and Hesiod had to say about Athena. I couldn't get her out of my head (there's a mythology joke there for those who catch it; couldn't resist). One thing I had never known about her before is that she was believed to have golden arms and bright blue eyes; I learned this during my reading that day, and I still can't say why it struck me. I decided it was about time to find some sort of imagery for her to put in my office; in the very least I could go antique shopping and find a nice picture or statue of an owl, her sacred animal. I said a little prayer to her before I left, again, just out of symbolism and ritual, not out of any real belief. For some reason I decided to drive to Georgetown instead of going to my usual favorite spots in Austin or Round Rock. I parked; I walked until I found a shop that just felt right. Without thinking, I walked in the door and walked straight to one particular display case. This was the first shop I had entered and the first case I approached. There, at eye level was the perfect little statue of an owl. That alone would be a happy coincidence. But here's the weird part: it wasn't just a statue of an owl. It was a gold-colored metal statue with bright blue glass eyes, and with Greek letters etched on the base: it actually bore the name of Athena. And I found out later that the day that I went, the day that I found the statue, coincided with a Greek holiday to Athena where workers celebrated the influence she had over their occupations. Do I believe there was some kind of supernatural intervention here? No, not really. These were amazing coincidences, but they could just be coincidences. But this is more than the God of Christianity had ever done for me when I was struggling with my faith and praying for a sign. So, if I as an atheist were to take the reasoning of the OP seriously, and lower my standards of evidence, I should really believe in the Greek gods rather than Christianity. But I'm not going to do that; and, even if I did, I would not expect anyone else to take my second-hand story as proof the way that the OP wants us to do for Christianity. RiaRaeb and Diuretic like this. Are you kidding?!?! 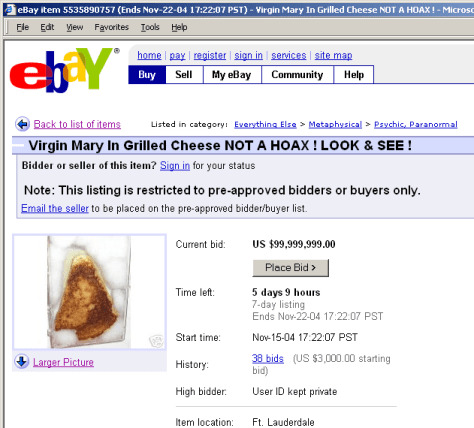 Do you know what a virgin Mary on grilled cheese sells for these days? But, let's admit that we're not going to end any of the major religions by anything we do or say as individuals or as a nation. I think we need to identify the parts that we can't give up on - such as attacks on science, our understanding of healthcare, our concern about our environment, our individual rights, the separation of church and state, etc., etc. If they want to believe that the big bang was created by god, or that Lazarus had no brainwave activity, or whatever, I'm actually reasonably OK with that. If we have no reason to believe then why would you even post such a self defeating argument? Better yet, does it even make sense for an omnipotent and transcendent God to have objectives at all? Objectives themselves seem entangled in concepts of linear time and limitations. Well, I was saying that we have no reason to believe something about god's intent. I didn't mean that sentence to be interpreted as not believing in god's existence. I mean that if we can't know god's full intent (which even the bible says we do not), then guessing about why god might or might not take some specific action is somewhat ridiculous. If we can't know god's full intent, how could we guess whether god proving his own existence would be something god would want to do?